Cllr. Rachael Coles supports the CATS Club and takes an interest in the Task Force activities. She loves animals and has her work cut out looking after her 5 dogs. Active member of Rowe Avenue Surgery Patient Participation Group and the Town Forum. Cllr. Andy Loraine is associated with the Wave Leisure Group and is a representative for the Peacehaven and Telscombe Housing Association. Cllr. Andy Lorraine is also a Lewes District Councillor. Cllr. 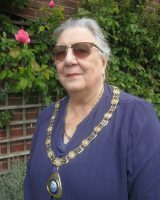 Sue Griffiths is associated with Peacehaven community orchard, Peacehaven & Telscombe Access group, The conversation Garden, Neighbourhood Development plan steering group, Member of Alternative technology centre and also a member for Brighton Permaculture Trust. Job’s interest is photography and has enjoyed cycling over the years. Cllr. Harris is also associated with Crime Stoppers. member of Peacehaven & District Residents Association.